A Jerusalem court issues temporary confiscation order for 2 Norwegian ships planning to sail to Gaza; if they are intercepted and towed to an Israeli port, their value will be paid to terror victims families as compensation. The Jerusalem District Court issued a temporary confiscation order Wednesday for two Norwegian ships set to partake in a solidarity flotilla to Gaza in the coming weeks. The court order allows for the Karstein and Freedom, worth approximately 75,000 euros, to be used for monetary compensation for victims of Hamas terrorism the moment they enter Israeli waters. Organizers of the flotilla say that if they succeed in reaching Gaza they will donate the ships to civilian organizations and local fishermen. Shurat HaDin Israel Law Center, the NGO that submitted the impound claim on behalf of terror victims, says that in the view of former Dep. Navy Commander Brig. Gen. Noam Feig, and Middle East scholar Aryeh Spitzen, the ships are intended to be used by Hamas which is seeking to strengthen its naval forces. The petition was submitted in the name of the Gavish family which lost the couple David and Rachel, together with their son Avraham, and maternal grandfather Yitzhak Kanner, in an attack on Passover 2002. It was also submitted in the name of the family of Adam Weinstein who was killed in a 2001 Jerusalem terror attack. Hamas claimed responsibility for both attacks and the families submitted claims for compensation from the organization. In 2006, the court ruled that Hamas must pay the Gavish family NIS 90 million. The Weinstein family still awaits a ruling. The Gavish family has yet to receive any compensation, leading them to sue for the ships that are headed for Israel. 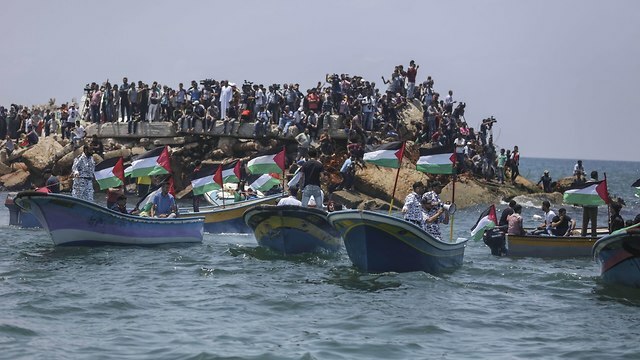 “Flotilla organizers come over here every year in attempts to breach the naval blockade of the Gaza Strip and violate the sovereignty of Israel,” said Shurat HaDin Director Attorney Nitzana Darshan-Leitner.